One of my subscribers recently commented that she hoped I would post some practical tips for making an older home more energy efficient and environmentally friendly. So today I’m launching the first of a monthly series I’m calling “Practical Sustainability” – things we all can (and should!) do on a limited budget. This month’s column is all about showers - specifically, changing to low flow shower heads. Now that I have your attention, what does this really mean in terms of your impact on the environment? First, if you’re like me, you probably prefer a warm shower to a cold shower! And that means you’re using energy to heat all of that water. The EPA estimates that if every household in the US installed WaterSense low flow shower heads, we’d save $2.6 billion in energy costs for heating water alone. And now think about where that wasted water comes from and where it goes after it heads down your drain. If your water comes from a municipal source, the water was treated at a water treatment plant and then piped to your home. By using less water for showers, you’ll reduce the size of your water bill and lower the stress on our treatment and sewer systems. California and other western states are experiencing a severe drought this year – a continuation of the conditions that earned 2013 the dubious honor of being the “driest year in recorded history for many areas of California.” So, saving water isn’t only about the impact on our wallets – but it’s also about recognizing that water is a scarce resource that we need to conserve. And yet…haven’t we all encountered a cheap plastic hotel shower head that barely provided enough pressure to rinse the shampoo off a bald person’s head? And is THAT what we’re signing up for if we switch to WaterSense labeled shower heads? I recently embarked on a very unscientific search for an answer. As it turns out, we had a leak a couple of months ago from our master shower into the apartment below us. We had to demolish the shower in order to replace its leaky shower pan. 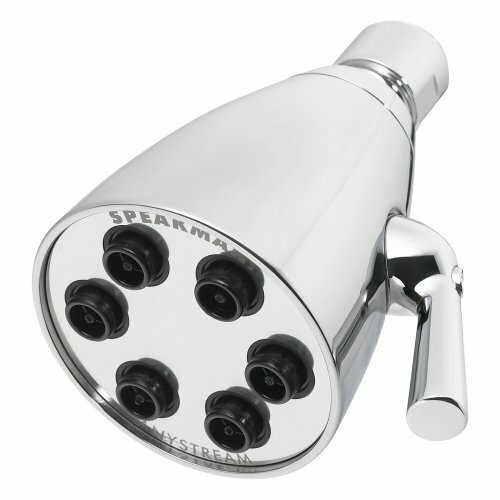 We had renovated our apartment about 10 years earlier and had installed – and were very happy with – 2.5gpm Speakman Anystream shower heads in all of our showers. Unfortunately, for some inexplicable reason, our shower head started spraying water from the perimeter of its faceplate following the shower stall repair. Since we need to select shower heads for the Sunset Green Home, I decided to look at this as an opportunity to “test drive” Speakman’s low flow 2.0gpm Anystream shower head (Sunset Green Home will earn one point under the LEED® for Homes rating system by installing shower heads whose average flow rate is 2.0gpm or less). I’m an Amazon.com junkie (ever since I purchased their Amazon Prime service, which gives me free two-day shipping on nearly everything). So I turned to Amazon, where I found the S-2252-E2 low flow shower head for $66.48 (a 34% discount from the list price…and as of the date of this article the price has fallen even further, so I'm about to purchase a second one for my children's bathroom). It came with plumbers’ tape and took about 45 seconds to install. All I needed was a set of pliers. And while my trial of a single shower head certainly can’t claim to be representative of an entire product class, I’m happy to report that the low flow Speakman Anystream shower head delivers on its promise. It provides a stream of water that handily rinsed the shampoo out of my long thick hair. Did I notice that the water flow is lower than with my old shower head? Yes. But did I find it problematic? Not at all. So go ahead…change to low flow shower heads. Do something for the environment that won’t break the bank. And check back next month for another Practical Sustainability column! Leave a comment and share which low flow shower head works for you! Newer PostPractical Sustainability: It's Time to Change Your Lightbulbs! Older PostFire Safety Part I: Residential Fire Sprinkler System for the Sunset Green Home?